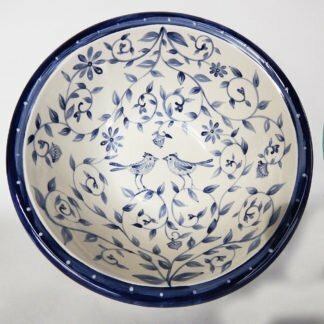 Two matching goblets with the roses and bachelor buttons compliment the long love wedding serving bowl. Each goblet is painted freehand in a rich vine & floral pattern signifying a love that grows. The bride & Groom’s names and wedding date are on the bottom of each one. 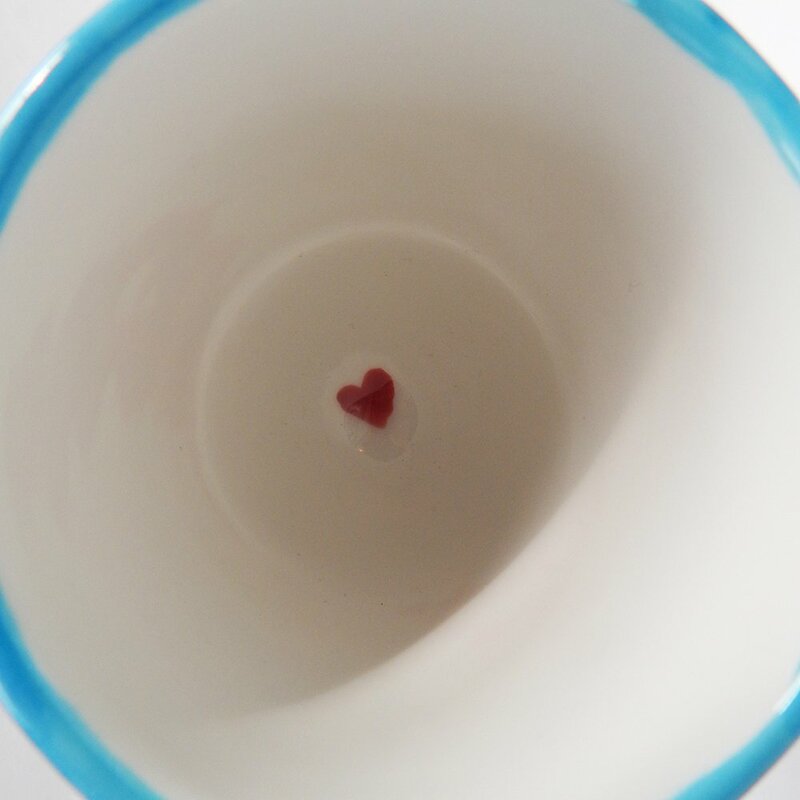 A red heart is painted inside the cup area. All are food safe. Perfect for the wedding toast and many evenings after! 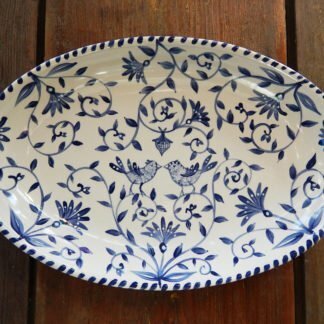 A matching serving bowl may be customized also- see the “long Love” Wedding Bowl. Give these Personalized Wedding Goblets; Long Love is a well tended Garden at the bridal shower! Two matching goblets with the roses and bachelor buttons compliment the long love wedding serving bowl. 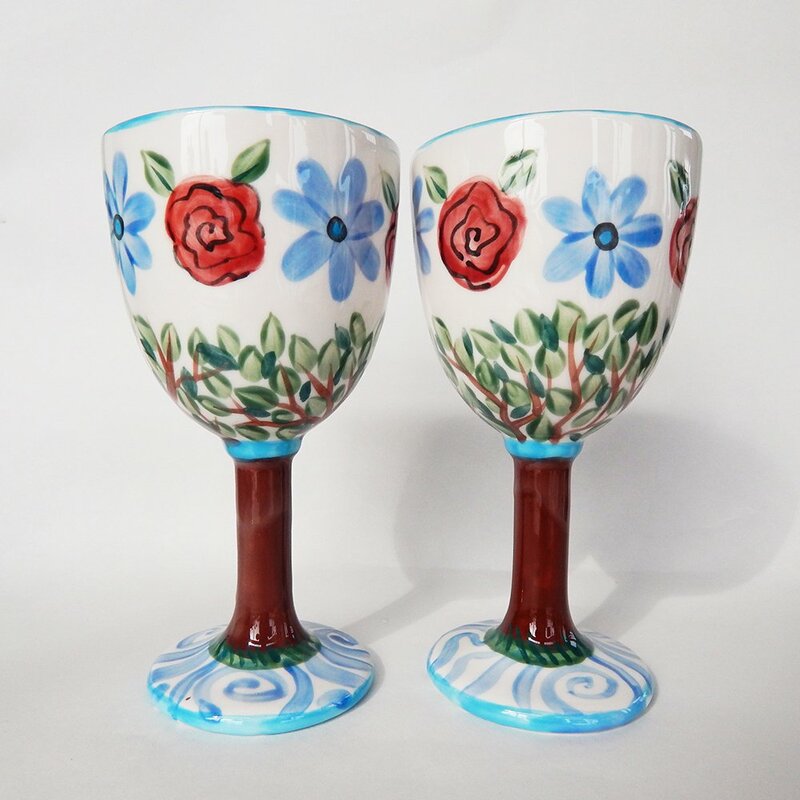 Each goblet is painted freehand in a rich vine & floral pattern signifying a love that grows. The bride & Groom’s names and wedding date are on the bottom of each one. A red heart is painted inside the cup area. All are food safe. Perfect for the wedding toast and many evenings after! 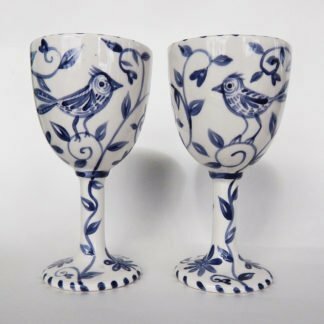 The goblets measure 8″ tall x 4″ wide. They are sold as a pair. Food safe- great for wine as well as morning coffee. Personalized Wedding Goblets; Long Love is a well tended Garden match serving bowl & platter! 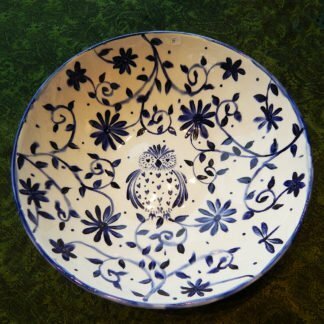 A matching serving bowl may be customized also- see the “long Love” Wedding Bowl. I made the first Custom Ceramic Long Love Wedding bowl for our lovely neighbors across street as they celebrated their 65th wedding anniversary. Both are avid gardeners as they tackle their lush yard together. A relationship is a journey through all kinds of weather so it’s best to travel with a friend that nurtures you through every season. You do need to tend that garden or spouse with care and empathy. Karl and Bettie’s garden is now 75 years of love. 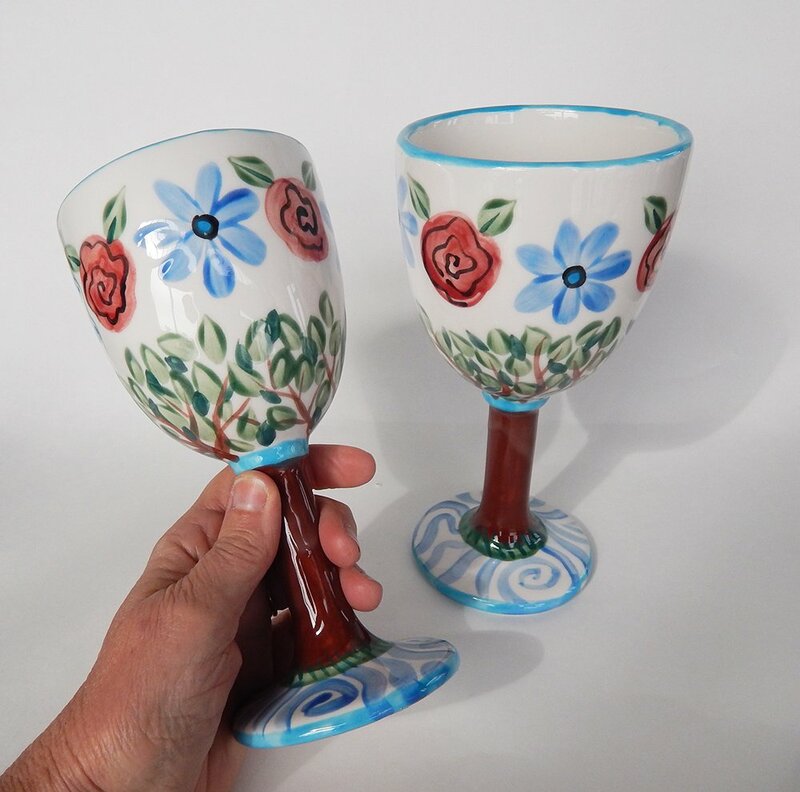 I paint the bride and groom’s names and wedding dates on the bottom of each goblet. The outside has alternating bachelor buttons & roses. All handpainted in bright underglazes by me. This is one of my most popular designs. 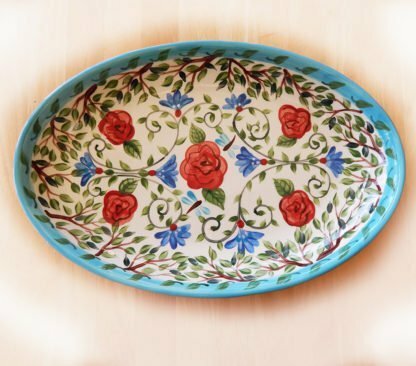 Always one of the most favorite gifts at weddings or anniversaries. 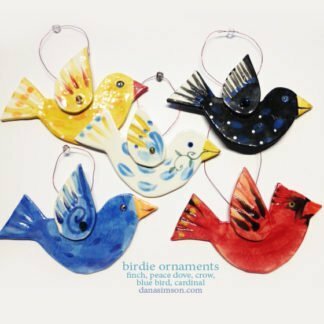 Visit our Gallery/ gift store on the Wicomico River in Salisbury, MD. It is a renovated hotel – now with 4 artfully decorated lofts upstairs available to rent. (Loft Links: Grande Luxe / Chic Sunny / Retro Loft / Spacious& Gracious)Downstairs is yummy Riverwalk Cafe and the Ugly Pie Bakery. Well worth a road trip!